In Hidden, a French family is terrorized by an unknown antagonist. Surveillance tapes of their luxurious town house are delivered to them along with drawings of a child with blood flowing from its mouth. The doorbell rings, but no one is there. The police are of no help and tension within the family grows. Issues of trust arise between Georges (Daniel Auteuil), moderator of a literary television program, and his wife Anne (Juliette Binoche). There is concern for their only son who is immersed in adolescent moodiness. Georges pays a visit to his mother (Annie Girardot) who lives on the family farm and pieces of the past start to surface. As a child, George had befriended Majid, the son of an Algerian couple who worked on the farm. On Oct. 17, 1961 some 200 Algerian protesters died at the hands of the Paris police, including, for purposes of Haneke’s tale, Majid’s parents. Georges and his family, who had considered adopting Majid, betray him, sending him away. As Georges continues to investigate clues as to the origin of the tapes and threats, his path crosses that of Majid these many years later. 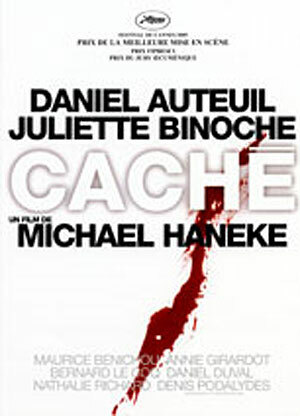 Director Michael Haneke (Time of the Wolf, The Piano Teacher) continues to deliver complex, challenging cinema in Hidden. Not one to offer simple answers or, for that matter, simple questions, Haneke explores his themes with a richness of thought and the kind of ambiguity that prohibits easy resolutions and passive viewing. His films demand active intellectual participation by the audience which is rewarded with insight rare in current film. French-Algerian relations and cultural conflictreflect world-wide differences between First World and Third World peoples, between have and have-nots. A certain smugness and sense of self-entitlement among the haves and the desperation of poverty, fueled by religious fervor, among the have-nots has heightened conflict, often taking the multiple forms of terrorism. It will leave some viewers off guard that Haneke never definitively exposes the perpetrator of the terror in Hidden (though numerous clues are furnished). But Haneke, as he builds tension, as well as a claustrophobic sense of threat, suggests that the particular source of a terrorist act is not the point. Terrorism has become a world-wide phenomenon; a vast population of people who have nothing to lose will produce willing participants to terror so long as the social and economic injustices of the colonial and post-colonial eras continues. Events of recent years have left the western world in fear of continuing terrorist acts; no one feelsas secure from violence as they did even a decade ago. Haneke approaches the issue from the microcosm, from the experience of one family and its own history ofcultural insensitivity, but his message is universal. Takingthe traditional thriller genre and retaining its quality of gripping suspense, Haneke subverts it into a trenchant commentary on the seemingly irresolvable malignant conflicts of our time.